To celebrate we had our first outdoor picnic of the season afterward for lunch. We ended up just plopping a blanket in our backyard (the program ran late and the Sweet Peas were hungry! ), and R, G, Grandma and I enjoyed the picture perfect day. 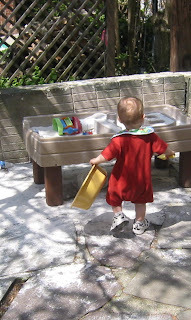 G ended up just toddling around, wearing his bib but what can you expect from a 15 month old? This versatile picnic or portable dish is great for on-the-go or just as wonderful as a side dish for a dinner inside. It is a little different each time we make it, we change the beans and vegetables depending on what we have on hand. Although this recipe has a jalepeno in it, as long as you remove the seeds it is not spicy, just wonderfully flavorful. This is my favorite way to use leftover rice! Mix the salad ingredients together in a bowl. Mix dressing in a separate bowl, pour dressing over the salad. Tastes best if you let the flavors marinade a few hours or overnight. So R did well this year, compared to last year? Yeah!